This guy landed at Half Moon Bay while we were there. I have to admit I thought I was taking pictures for the accident investigation at first. However, he maintained this pose all along the runway until he turned off and apparently had done it earlier. I guess he had a lot of elevator authority. However, whether it is a good idea is a very different question. 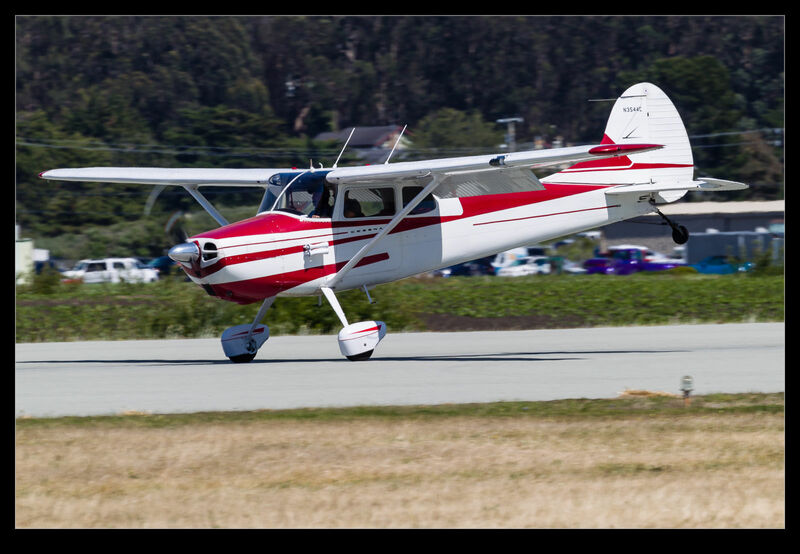 This entry was posted in aircraft, civil, photo and tagged aircraft, airplane, california, cessna, down, half moon bay, high, landing, light, nose, photo, piston, tail, technique. Bookmark the permalink. I came across your picture and wanted to hopefully shed some light on the situation. I’m 28. I’ve been flying for my entire life, but can only claim time in my logbook for the past 18 years. My family has owned a 1952 Cessna 170B (same aircraft and model, simply an older year model than the photographed airplane) since 1986. While seemingly extreme, this type of landing is called a “wheel landing” and is common practice in an airplane with conventional landing gear. It is generally used when there is a stronger surface wind as the airplane’s approach speed may be made slightly higher and the touchdown speed can be slightly higher as well. This allows for a much more controlled touchdown and is particularly necessary when used in crosswind landings on pavement. The airplane in question is not in any danger of being in an accident; consequently, the technique used was to prevent a groundloop. The datum line for the airplane that is used to determine a level flight attitude is are the side windows on the main cabin entry doors. As you can see, these windows parallel the ground (sloping downward slightly as is the ground). The landing gear is also not splayed out, displaying that there is not excessive force used to keep the airplane on the ground. These landing gear must be slightly loaded so as to prevent loss of directional control on the ground. Your image is a little misleading to say the least, in my opinion. The technique used was the same that I would have used to prevent damage from loss of directional control on landing.